The 26 in. (590) Radial 36 Spoke Aluminum Wheelchair Wheel and Tire features an attractive anodized aluminum finish, 36 spokes for added strength, and choice of air filled pneumatic or flat free tire. Choose the Primo Racer tire or the Shox flat-free urethane tire with herringbone tread. Both tires are available in several colors. Fits a variety of wheelchairs from Invacare, TiLite, Quickie, Colours, or any other brand needing a 590 mm size. 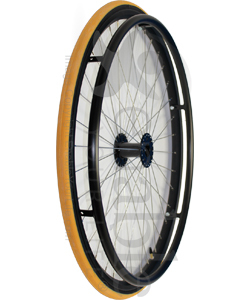 This wheelchair wheel fits wheelchairs using a 1/2 inch diameter axle bolt or 1/2 inch diameter quick release axle. To know if your existing axle will work, add the width of the hub (2 1/16" - measured from bearing to bearing) and add it to the length of your axle carrier tube on the wheelchair and add approx 1/2" for the axle nut. If the axle is not long enough you will need to get a longer one. If you are using quick release axles, the length of the axle is measured from the underside of the adjustment nut to the start of the retractable ball. Most quick release axles have an adjustment up to a 1/4" for a snug fit.